We all experience grief. The death of a parent, child, or dear friend. The loss of a hope held close to our hearts. The decay of a relationship. Betrayal from a friend. And even in the midst of that mourning, we’re blessed because God promises comfort (John 14:16-18; 2 Cor. 1:3-7). He can respond to our tears as powerfully as He did for David in the situation recorded in Psalm 6. There’s also another interpretation we can add. In Ezekiel, God talks about sparing from His judgment “the men that sigh and that cry over all the abominations that are done within” Jerusalem (Ezk. 9:4, WEB). God knows what it’s like to have the wickedness done in the world breaks your heart (Gen. 6:5-7). He will comfort those who share His heartache and promises to set things right in the end. In English, we typically associate meekness with weakness. But according to Zodhiates’ dictionary, that’s not what prautes means (G4240, closely related to the word used here in Matthew, which is G4239, praus). Rather, it is that “attitude of spirit in which we accept God’s dealings with us as good and do not dispute or resist. … a condition of mind and heart which demonstrates gentleness not in weakness but in power.” When we submit what we are and have in this life to God, He makes us inheritors with Christ of the whole earth. One of God’s names is Yahweh Tsidkenu — the Lord our Righteousness (Jer. 23:6; 33:16). A yearning for righteousness is a deep commitment to seeking God and His way of life. Nothing else will satisfy so we never stop pursuing Him with all our heart, mind, soul, and strength. Such a hunger and thirst is going to change us, for we cannot be filled with the Lord’s righteousness and not start becoming righteous ourselves. Our actions toward others determine, at least in part, God’s actions toward us. Later in this sermon, Jesus says we’ll be forgiven if we forgive others and that we’ll be judged the same way we judge others (Matt. 6:14-15; 7:2). In addition, we learn from James that “Judgment is without mercy to him who has shown no mercy. Mercy triumphs over judgment” (Jas. 2:13, WEB). 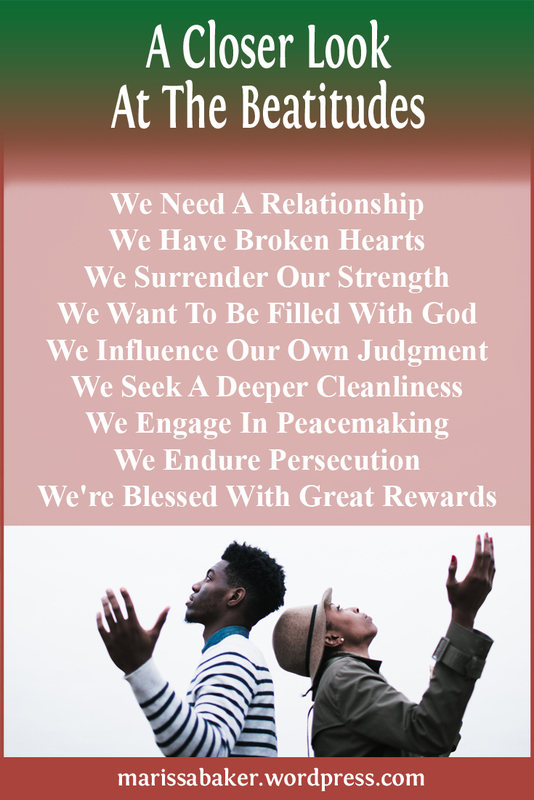 While these instructions do tell us about things that Christians “should” do, they’re more connected with learning God’s character than with a legalistic set of rules. Showing mercy is one of the things we naturally start doing when we’re filled with God’s righteousness. Adam Clarke’s commentary on this verse contrasts internal purity with the Jewish customs of outward washing. Jesus was probably alluding to the fact that legally pure Jews could enter the temple (and in a way “see” God), but the focus here is on a deeper cleanliness. Clarke writes, ” Christ here shows that a purification of the heart, from all vile affections and desires, is essentially requisite in order to enter into the kingdom of God.” The internal transformation triggered by relationship with God leads to a deeper knowing of Him. As in English, erenopoios (G1518) is a compound of peace (G1515, eirene) and maker (G4160, poieo). The words are only used together a few times in scripture — here, in James 3:18 talking about the fruit of righteousness being sown by them that make peace, and of Jesus. Ephesians 2:14-15 talks about His work to make peace by reconciling us to God. Peacemaking is an activity of our elder brother, Jesus Christ, and should be an activity of all God’s children. No one wants persecution. And in a country where freedom of speech and religion are seen as human rights, we think we deserve not to deal with that. But Christians are promised opposition from the world for righteousness’ sake and because we follow Jesus. How we live and who we follow sets us apart from the world, and it refuses to tolerate our differences because it refuses to acknowledge God’s right to rule. But when we endure this persecution and keep pursuing God’s righteousness, we’re blessed. Such blessings sometimes come in this life and most definitely will come in the next. And so Jesus wraps up this thought by saying, “Rejoice, and be exceeding glad: for great is your reward in heaven” (Matt. 5:12, KJV). 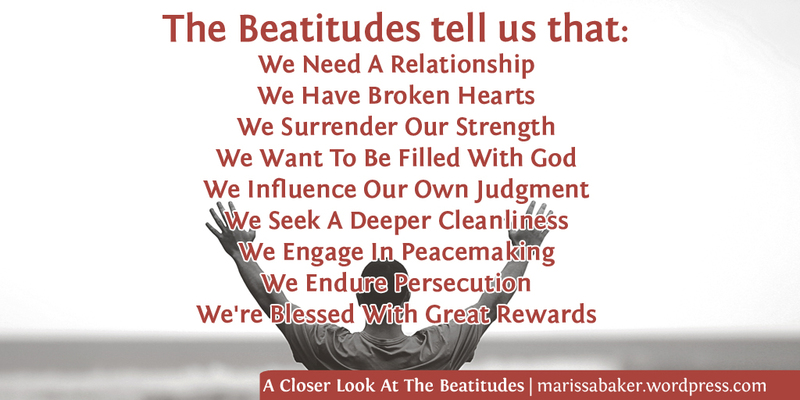 It’s pretty easy to read over these promises when they’re in-context since we’re so familiar with the Beatitudes. Seeing them all together like actually this leaves me a bit choked up. God wants to do all that for you and for me? It’s hard to wrap our minds around, but people who follow God really are promised some incredible blessings. And we ought not be shy about claiming them.